- A 16 inch, northern Michigan-grown gourd (callabash)(alternatives discussed below). - Elk hide rawhide (non-tanned) skin. Other not-too-thin skins should work fine as well. - Geared, Grover-type guitar string-tuners. Less expensive tuners work nicely too. 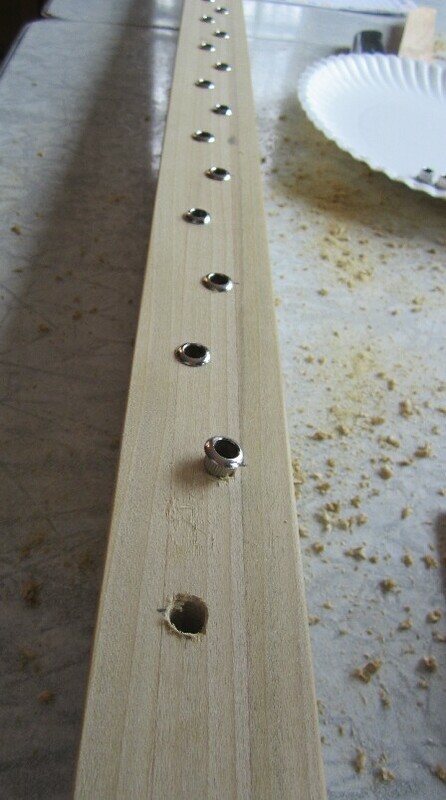 - A few hardware-store hardwood dowels. 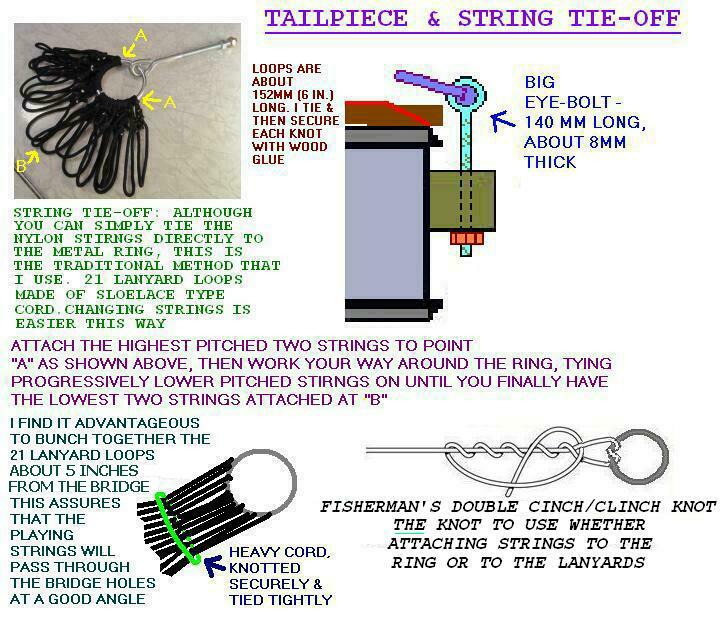 - 21 strings - fish-line (for most) & weed-whip line. tuning gears very successfully, I opted to try similar tuners on this Kora. each) over my decades of instrument tinkering, I have never had a single failure. Grover-type weren't that much heavier and they worked perfectly. climes. Mine is 16 inches in diameter and 5/16 inches thick. large, sturdy gourds a lot more commonly available than I'd one time thought. 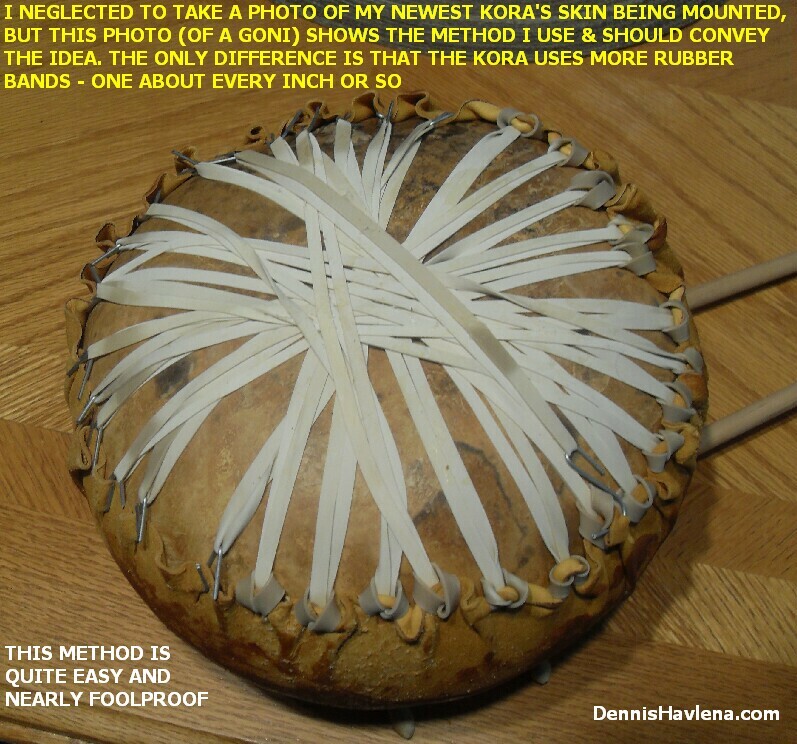 "northern Michigan Kora" article on my webpage where I used a beach-ball as the form). 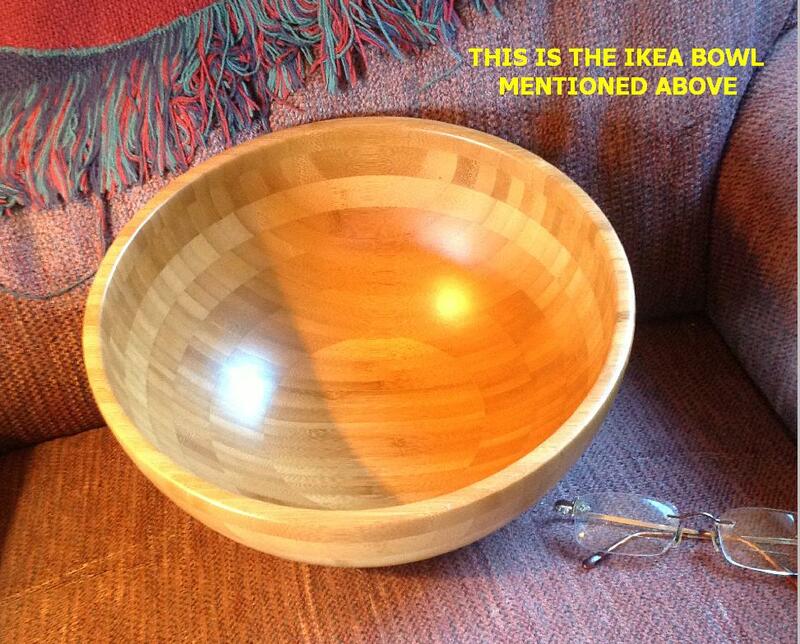 salad-mixing bowl. I recently found a beauty - at the Ann Arbor Ikea store for $20. It only measures 11 inches in diameter but I've seen Koras made of yet smaller gourds. I like it so well that I've started on my next project - a Kora using this bowl. edge on this sandpaper, a nice, flat surface for mounting the skin head is obtained. to make a sharp bend over it. This scares off a lot of folks but it's very simple for even a beginner to do. looking, thickest part of your hide. It doesn't even have go be round. hooks go through these holes. are stretched over the gourd's bottom and hooked to S-hooks 180 degrees, on the opposite side. Soak the skin overnight in baby-bath temperature water - no hotter. soak up excess surface water. along the top inch or so of it's sides. Cheap insurance methinks. With the skin lying best-side-down on a flat surface, center the gourd opening atop it. hooking it to the appropriate S-hook (180 degrees across). Let everything sit this way for a couple of hours before tacking the skin in place. with small sheet-metal type screws (predirlling the holes first) which turned out to work fine. though it doesn't hurt to pre-drill a smaller guide-hole to insure against splitting the gourd. I do this a lot. 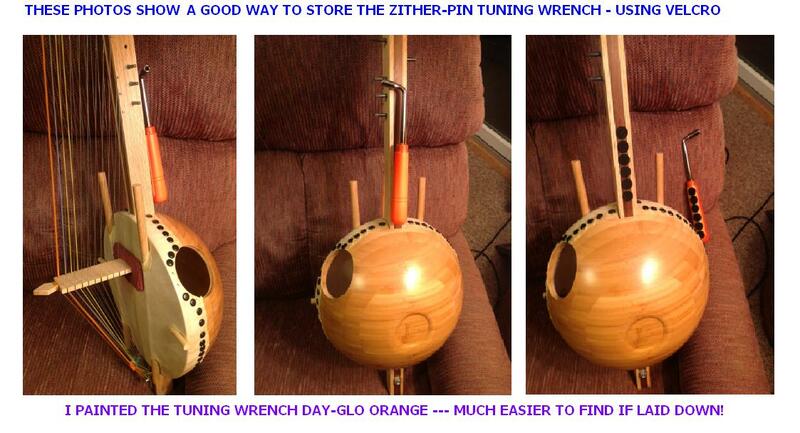 If you use a wooden "gourd" or other "not-gourd", pre-drilling is a necessity. perimeter of the stretched skin -- this too is very normal and accepted. There's no need to cut neck or sound holes yet. which are carefully routed atop the cross-brace before resurfacing at the hole opposite. Make sure the handle rods protrude far enough towards the tuning end of the neck. In warm and sunny weather, set the whole mess outside to dry & tighten in the sun. Alternately, atop a piano or cabinet inside dries things nicely too in a couple of days. scissors work great for this! & some repetitive drilling, glueing/clamping and tuner installing. 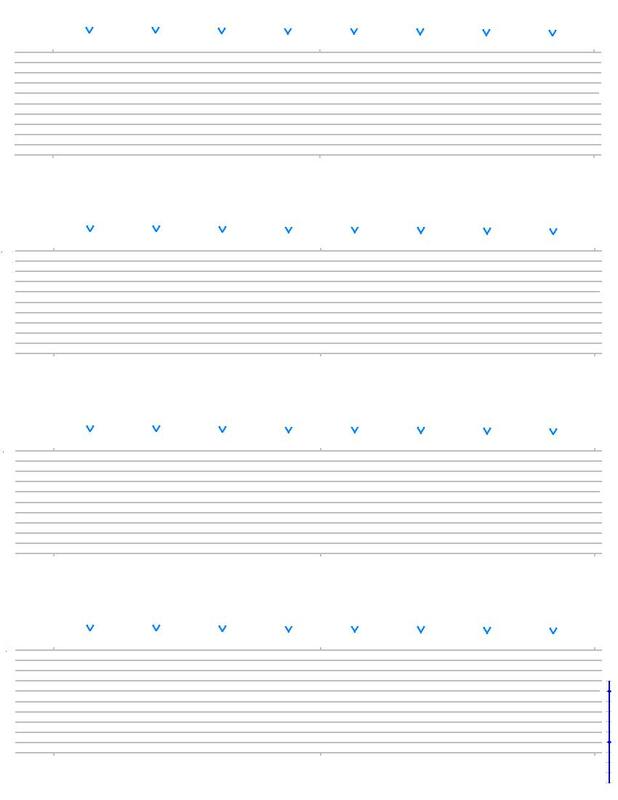 minimal "indentation". I've used "no bushings" a lot with no trouble. "cookie-tin" Kora's neck is pine and it's well into it's second decade with no problems. The soundhole on this instrument is oval and measures 83mm wide by 63mm tall. Not critical. 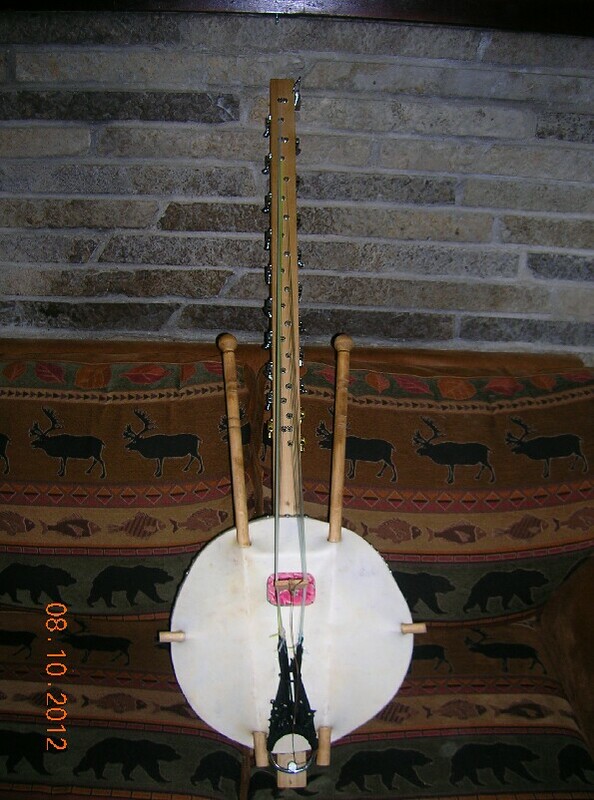 easily lean the instrument in a corner - the tuning paddle would hit the wall. Locate the bridge 944MM from "point X". I very successfully use softwood for Kora and other bridges altho hardwood will work fine too. downwards towards the tailpiece end. This lessens the chance of unwanted string buzz. works equally well. The photos show this guy-wire. 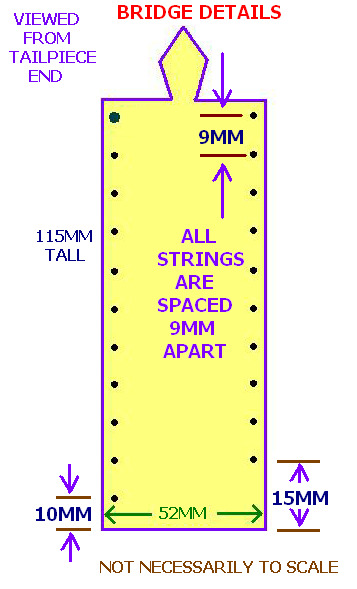 Note: with full string tension, it is very normal for the bridge to "sink" considerably. internet). The guy-wire will then likely have to be adjusted to keep the bridge upright. The amount of the neck sticking past the lower end of the instrument is not very important. are on the order of an inch and a half to two inches long or so. 20 LB, 25 LB, 30 LB, 40 LB, 50 LB, 60 LB (& 80 LB. if you can't find .040 inch diameter weedwhip line). any instrument.This is an unavoidable but fortunately short-lived situation. It takes about two or three weeks or so before the things completely settle down. Once thus settled, the instrument can go for months without requiring retuning. the bridge settles down into the head & various other wrinkles will likely appear. 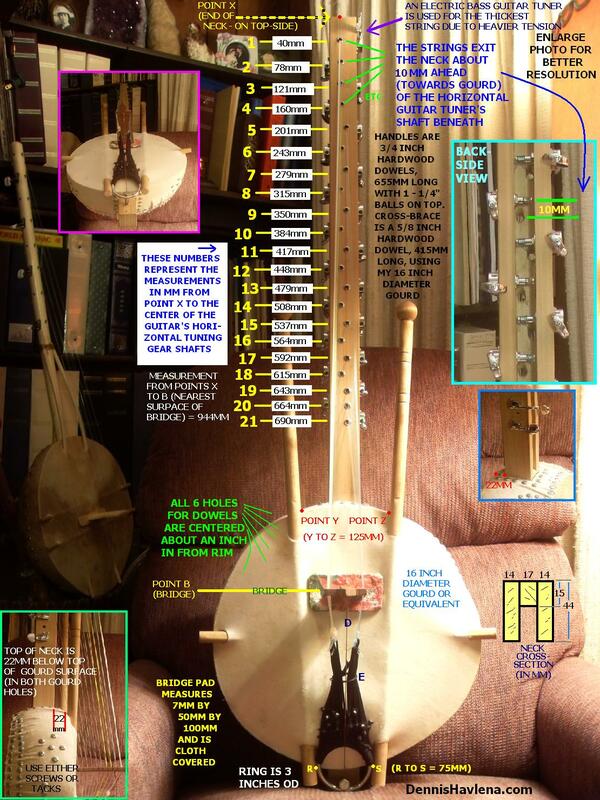 length isn't very critical, building a workable Kora is an easy, straightforward project. instrument & then take stabs at building some. I have learned a lot, but nowhere near enough. the strings are off the instrument. 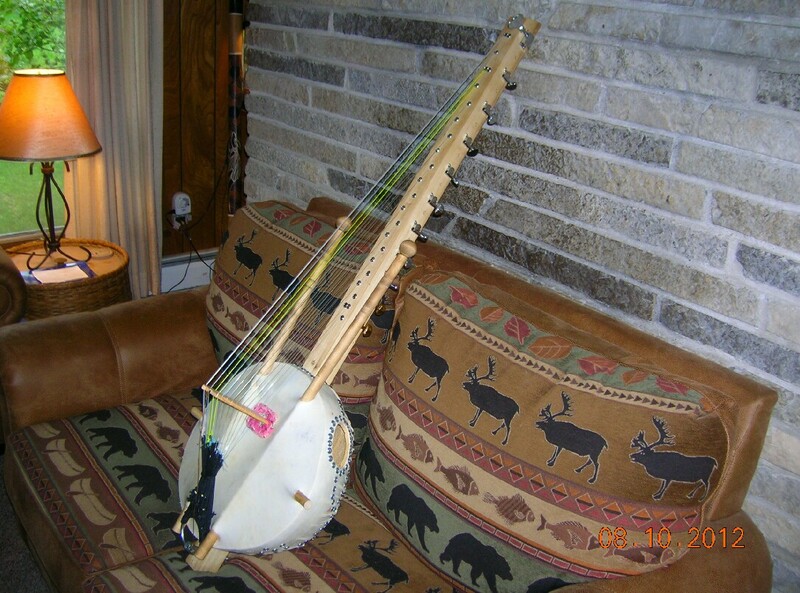 A number of folks have come up with forms of tablature for the Kora. Here's my "contribution"
a "cut-and-pastable" note line that you can insert into the tablature. 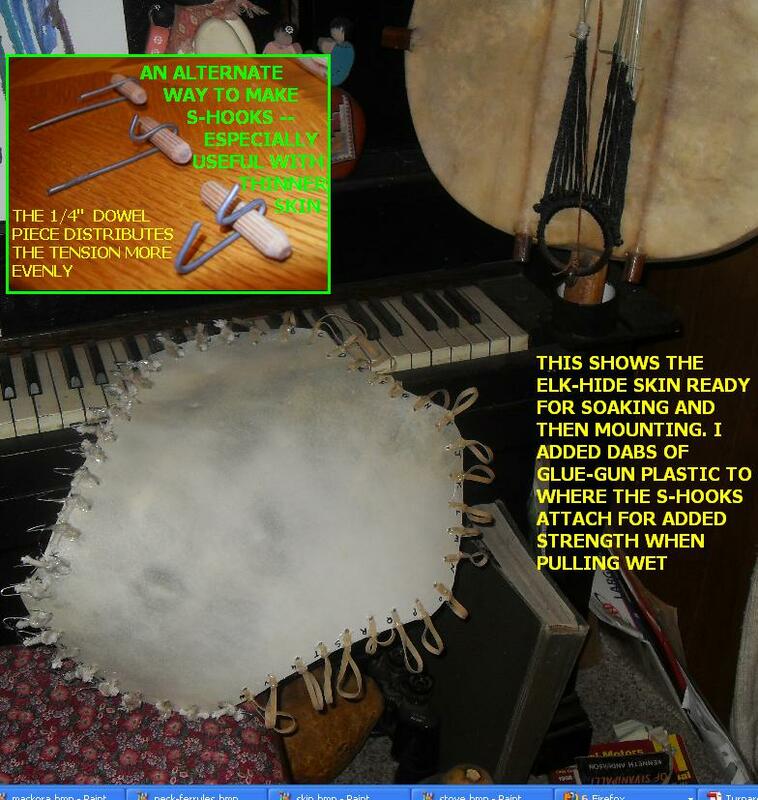 Also, let me know if you have any questions or build a Kora.